Rough Mobs is a small mod which makes some mobs significantly harder. This mod is pretty well configurable! You can change/disable every feature in your config file. The mod can also be used server-side only but it is not recommended because some features will be a bit buggy. Zombies apply the hunger effect to targets (The effect stacks up to level 4). Zombies can now break certain (configurable) blocks if they walk through them. Skeletons (also Wither) spawn with random enchanted armor (You can add/remove equipment in the config file). Skeletons always spawn with a Bow in their mainhand and a sword/axe in their offhand. If a player is near them Skeletons switch their weapons. Skeletons have a small chance to spawn as boss zombies which are very strong but they can drop some nice equipment. Small Slimes can stick on players head to apply nausea and slowness to them. Endermen have a chance to apply either blindness or nausea to targets. Witches apply random effects to entities around them. Witches spawn 4-7 Bats on death. Blazes create explosions on death. Blazes push the target away and deal damage to him if he attacks them with melee weapons. Always attack them with ranged weapons! Ghasts are now immune to arrows and other projectiles. Ghasts drop primed TNT when a player is below them. Small Magma Cubes drop lava on death. This can be very dangerous if they stick on your head. Bats can fly on player's head and drain half a heart per second. This feature seems to be a bit buggy on servers. Skeleton and Zombie Horses now burn in sunlight (1.0.11+ if they have no rider). 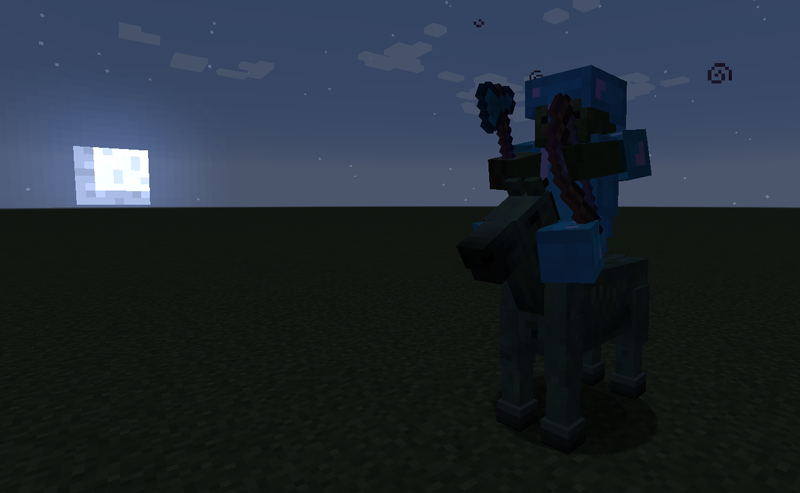 Skeleton and Zombie Horses can now break certain (configurable) blocks if they walk through them. Snowballs melt instantly when thrown in the nether. Also, many mobs have now an increased follow range! This mod also allows you to add/remove your own attributes to entities on spawn. You can increase: max HP, speed, knockback resistance, attack damage and follow range. The mod also allows you to create custom entity spawn entrys. More informations can be found in the config file. You can also lower entity spawn rates in the config file. Mobs no longer attack each other. This was often caused by Skeleton which tried to shoot the player but accidentally hit another mob. Mobs now always search for players around them before they attack. You can add/remove Entities for this feature in the config file. You are allowed to use all of my mods in your modpack! You don't need to credit me. Could you add a list format to enable burning in the daylight for mobs using mob id ie like the speed list. Would be nice for modded mobs and bats/enderman/spiders/cave spiders/etc. Will this be for 1.11.2 version? can you make the ender dragon harder too, like more abilities or something? EDIT: Killing myself a bazillion times finally removed it. This stuff needs to be default OFF in the config as it is extremely broken and toxic to any fun. Amazing Mod, love to boost mobs, specially vanilla one's. I notice if i boost their Health, they will be with the default amount of HP (vanilla) plus their missing health, for example. Zombie, default 20, plus 80, In game their health bar will be 20/80. Is there any way we can fix this or you can fix this? Thank you in advance for this awesome mod. Have a great day. Question/Suggestion here: I wanted to disable creeper enviromental damage, so that the combination of "explode while burning" and "burn in sunlight" is possible but not as critical as it is normally. I can't disable the terrain damage with other mods (like codechickencore) while this mod is loaded - does it change all vanilla mobs to custom mobs? Suggestion: add a command that enables/disables the content of this mod. This would allow the creation of a hardmode upon completing a certain task through HQM a la Terraria. For example, if you complete a quest in HQM and have it trigger a command that enables rough mobs, that could be a true difficulty change through progression. As you wanted suggestions: What about adding the ability to let passive mobs attack you once you hit them (I think special AI did something like this in 1.7.10). That way getting your bed might become more dangerous. Also having custom drops might be nice (the best would be having the mob properties mod from 1.7.10 in 1.10 but I assume that is some work). Testing out a bunch of hostile focused mods together, might have found a crash in this mod, code trace is related to iterating potions in one of your entities, strange that would cause a CME, forgot I had optifine installed though I doubt that is related, continuing to test without optifine, crash isnt frequent, was wandering in a roguelike dungeon when it happened. Sweet thanks, will try it out! How do I make "Undead horses" and "Skeleton horses" spawn less? Open up your config file and increase zombieHorseChance and skeletonHorseChance. How does this mod with with others like Enderzoo for example? It ignores all "new" mobs and works fine? It should work fine. You can also add some features to the mobs in the config file if you want. But I'm not sure what to type in order to disable it. Only remove the "diamond_helmet" within the angle brackets.